You have sung to me...and built a tower in the sky. But now our dream is over... and we must part. we shall speak again together, and you shall sing to me a deeper song. Friends and family, these are the parting words of Kahlil Gibran, The Prophet, poet of the poor Kadisha Valley in northeastern Lebanon. He was one of the spiritual artists of the western world. Today, we have gathered to bid farewell to Rachael Jerome Henry Richards, whom I loved dearly and whose love for all in her family is legendary. She was kind and generous, calm and caring, unflappable and unpretentious. She possessed the generosity of a Saint and the firm hand of a Mother Theresa. God has blest us by sending her to be our adult guardian and peacemaker; and, we thank the Almighty for his everlasting goodness. It is often the case that the love which flows among the members of a household or a family can indeed be traced to those at the very pinnacle of that family. Love often obeys the law of gravity, percolating downwards effortlessly. But, human love can also generate outwards and upwards, flowing against the tide just as easily, whether there are barriers or defenses. Rachael was able to cause love to spread out in every direction. She was loved, as she loved others; strangers loved her and she shared great joy and glad tidings with those she encountered. For her the season of Christmas was every day. On behalf of my own family, I begin by expressing condolences to the family of Rachael Jerome Henry Richards. She was an extraordinary woman whose death has left the community, the Constituency of St. John's Rural East and this country poorer. To the entire family of Ms. Richards, her children, her grandchildren, her relatives and friends, I want to assure you that I feel your pain. I feel the emptiness, the pain, the disappointment which naturally accompanies death. Death always robs families of loved-ones and, no matter the age of the deceased, the pain and emptiness are almost always beyond endurance. It is our belief in God and the promise of a better life in the hereafter that help to soften that pain. We feel your pain. Our presence here, in God's House, is intended to convey the assurance that we all need God when death strikes its final blow. But death has not struck its final blow. The children, grandchildren and great-grandchildren are a part of the living memory of our Rachael. She did as God commanded. Our sister was the beloved mother of five children. Like the Antiguan woman then and now, she was very strong. She became the matriarch of her family and ensured their well-being. Rachael, whom was like a second sister to my mother, Mrs. Josette Michael, worked closely with my family for over twelve years. My mother when recollecting on Rachael's time with us, would speak of her with great fondness. She was one of the most kind-hearted, generous, honest, sincere person you will ever know. It was a sad but joyous day, my mother used to reminisce, when Rachael left our employ to pursue greater opportunities to support her beloved children. Rachael embarked on the most unlikely, but in the end most rewarding career part as an employee of Her Majesty's Prison, where she worked diligently for over thirty (30) years. I think many of Rachael's co-workers could testify to her character. She considered her position in the Prison as her “niche” in life. She loved the responsibility it gave her, the opportunity to learn and self-improve — either through experience or the trials she endured in order to do her job better — and she loved the people that she worked with. Rachael's dedication and perseverance shone through in everything she did. Her commitment to her work and to her friends will be greatly missed. Rachael's love and devotion to her family will always be dearly remembered. Her examples of love, caring and determination lives as an inspiration to all of us. Our religion also seeks to comfort us in death. Those of us who are Christians believe that faith in the Almighty will cause us, on Judgment Day, to see that faces of our loved ones who have gone before. We believe that to love God, to do good works, and to live a life of charity will cause God to look favorably upon us after death, and that as a reward for goodness, we will see God's face. If this is indeed the formula for everlasting salvation, then I am compelled to believe that Rachael Henry Richards has already been welcomed into the arms of her Jesus. She has seen God's face. When Rachael was an infant, born on April 30th, 1938, sugarcane and cotton were all around us. Antigua and Barbuda was one huge patchwork of sugarcane and cotton plantations. Poverty was also everywhere, since wages and salaries were meager. Rachael's parents could only pray that she might have an opportunity at moving beyond Primary School. Rachael's future was limited by the opportunities available then. 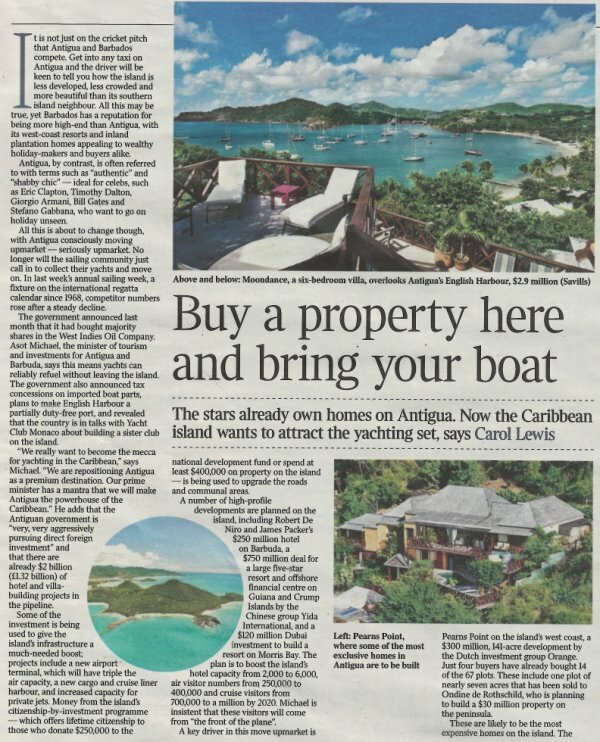 The transformation of Antigua and Barbuda from a place of extreme poverty to a modern developing island-state began in the earnest after 1976. The transformative years brought greater wealth and greater opportunities. Rachael wished for her children to make the best of the opportunities. And they did! The value of a person's life to her family, community or nation is often not measureable until the moment of death. Today, as we grieve over Rachael's passing, we recall the strength, the determination, the faith, the love, the unyielding dedication to her family, and their love for her. We recall her struggles, her victories, her many successes. We may have suffered a great loss. But, she fought the good fight, she did God's will, she pressed forward to make the best of the opportunities available for her children, she was exemplary in so many ways. She will forever be remembered. May God continue to bless her and keep her, and may his face shine upon her, and be generous unto her. May he lift up his countenance upon her and give her peace, now and forever. And so, we must take her death as a sign and symbol that we do not know the hour of our final parting. It may be sudden. It may be long. It may be now, it may be later. But whatever and whenever, we must know that those who would sum up our lives must confidently say, that we worked by the sweat of our brow and with the brow of our brain to change the world. That for sure, and in sum, was true of Rachael Jerome Henry Richards as it is true of all truly remarkable men and women. They fly forgotten as a dream dies at the close of day. Rachael Jerome Henry Richards will continue to live on in our memory. May the God who guided us in our years as an oppressed people, continue to guide her footsteps in the other life. And when the earth shall claim your wings, then shall you truly dance. Dance Rachael, my dear Rachael dance on! 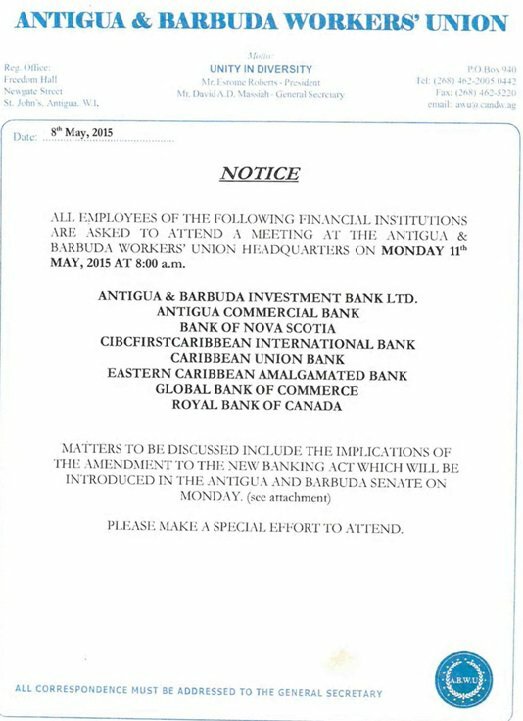 The Government of Antigua and Barbuda has been reliably informed that the Antigua and Barbuda Workers' Union is encouraging staff members of commercial banks in Antigua to carry out industrial action, on Monday morning 11th May 2015. The employees of eight banks have been encouraged by the Antigua and Barbuda Workers' Union—whose General Secretary has been clearly misleading them—to stay away from their workplace on Monday morning. The planned protest action is based on a deliberate misreading of the definition of “officer” in the recently passed “Banking Act 2015”. The definition of “officer” within the new law is limited to the President, the Vice President, the Chief Executive Officer, the Chief Operating Officer, the Chief Accountant, the Chief Auditor, the Chief Investment Officer, the Chief Compliance Officer, or the Chief Risk Officer of the commercial banks. Staff members of commercial banks who do not hold any of these positions do not fall within the definition; therefore, those staff members need not fear any provision in the law. Clearly, the law seeks to prevent “Officers” in banks from using staff members as their surrogates to undertake actions that usually fall within the job descriptions of those officers. A staff member in a commercial bank who performs daily routines does not fall within the net of “officers”, whose actions and decisions are intended to be captured by the Banking Act 2015. The ABWU General Secretary has also been intentionally lending an inaccurate misreading to the adjusted language involving the severance pay to which workers are entitled. The Parliament of Antigua and Barbuda added the words “severance pay” to the uniform act, thereby making clear that workers in banks will receive the full severance to which they are entitled, should a bank be liquidated. It is worthy to note that under the 2005 Banking Act, adopted by the UPP administration, no reference or promise was made in Section 55(1)(b) to severance pay for workers. The UPP adopted the law on September 13, 2005, and no arrangements were made in that law to pay bank workers their severance pay in the event of liquidation. The attempt to mislead bank workers into thinking that they are at risk of being unfairly targeted is a deliberate political ploy. The intentional misreading of the draft 2015 uniform law, in which reference is now made to “severance pay”, is nothing but a cheap political ploy using bank workers as pawns. Any industrial action based on these false premises can only harm and injure these same workers, their families, the economy and the Antigua and Barbuda nation. The uniform law, to be adopted by the eight countries of the East Caribbean Currency Union, is intended to make bank deposits by the vast majority of customers safer. The Government of Antigua and Barbuda condemns any planned industrial action that is based on deliberately false information. Such industrial action will unfairly and unjustly harm innocent depositors, businesses and the economy of the country. Staff members of the eight commercial banks are encouraged to reject any effort to make them pawns in a political game and to go to their jobs on Monday morning, as usual.